Corporal Andres Aguilar, Jr. was born in Victoria, Texas, on 20 May 1984. He graduated from Memorial High School in 2002, where he played football and soccer. He joined the United States Marine Corps on 4 June 2002, at Marine Corps Recruit Depot San Diego, California, and continued his Military Occupational Specialty training at the Ground Communications Repair Course at Twentynine Palms, California. 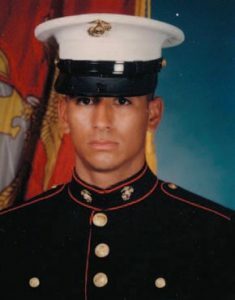 After graduating from Ground Communications Repair Course, Corporal Aguilar was assigned as a 2844 Communications Repair Technician to 3d Battalion, 3d Marines, on 25 March 2003. While assigned to America’s Battalion, he deployed once as part of the Battalion Landing Team for the 31st Marine Expeditionary Unit, once in support of Operation ENDURING FREEDOM in Afghanistan, and most recently to Iraq in support of Operation IRAQI FREEDOM where he was killed in action. Corporal Aguilar’s personal awards include the Navy and Marine Corps Achievement Medal and the Good Conduct Medal. He is survived by his mother, Olivia Aguilar, and his father, Andres Aguilar, Sr.